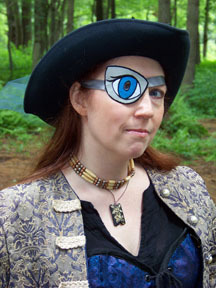 In 2011, there were (or will be) eleven renaissance faires and two large SCA events in New England. (That I know of. For all I know, there were even more.) That is a LOT of potential vending opportunities, and I know there are some vendors who made it to every one of them. I am not one of those vendors. Instead, I did three faires, and one SCA event. So, how did I decide which events to do? It’s not always an easy thing — there are a lot of things to factor into these kinds of decisions. At first glance, it seems like doing as many shows as possible can only be good for business — in theory, I sell more at a faire than I do online in a month when I do one. So how could it not be to my benefit to go to as many as possible? I think about a lot of things when I contemplate a show. Is it an established show? These tend to be more reliable — you have a sense of how many people to expect, and the more people walk through the gates, the more likely you are to sell stuff. First- and even second-year shows can’t tell with any accuracy how many people to expect. I don’t always pass on first-year shows, but they do have to be able to sell themselves to me harder than established shows do. Does it overlap with any other shows? With so many cropping up lately, and a limited number of months when outdoor events are feasible in New England, it’s inevitable that some will — and then you have to choose one over another. Is it CLOSE in dates to another show? Even without overlapping, this can sometimes nix a show from my schedule. If I’ve just come off of a large show, I probably won’t have the stock to do another right away — time to work in the studio is just as important as getting my face out there. Have I vended there before? If I have, how was my experience? Let me tell you, nothing beats first hand experience. Not only in terms of sales and attendance, but your interactions with faire staff and owners, and for getting a general feel of an event. If I haven’t vended a show before, I like to try to at least attend as a patron before committing. If I can’t get to a show myself, I like to talk to other vendors who’ve done it, and get a second-hand feel for whether a show is a good match for me. Other vendors often have a perspective that other people can’t give me, and building this network has been really important. How much are the vendor fees? It always costs money to vend a show, and I need to know if my potential earnings will be greater than my expenses. The fee can be a big part of that — a first-year faire that is charging the same amount to vend as a 10-year-old show with proven attendance just isn’t going to get my money. How far do I have to travel? This also factors into the expenses. The farther I drive, the more mileage that is. And it probably means a hotel room, and certainly meals out. There is no set formula for how I choose to do (or not to do) a show. And I don’t always make the right call — sometimes I find myself at a show that is a dud, and sometimes I pass on a first-year show that turns out remarkably successful. But these are all questions I ask myself every time I hear about a new show. But these are all questions that I ask myself when I’m thinking about vending at a show or an event. And hopefully, if I make good decisions, I can afford to add more shows to my calendar in future years. Bad websites make my brain hurt. A guest post by Michael Bailey. Later this year, Veronica plans to vend at a brand-new wintertime event now in the early planning stages. While this is not yet a done deal, Veronica offered her services when it came time to launch a website for the event. Why would a costume designer offer to help out with the website? you might ask, and the answer is simple: because she supports the people putting this thing together and wants them to avoid the counterproductive pitfall of the Lousy Website. 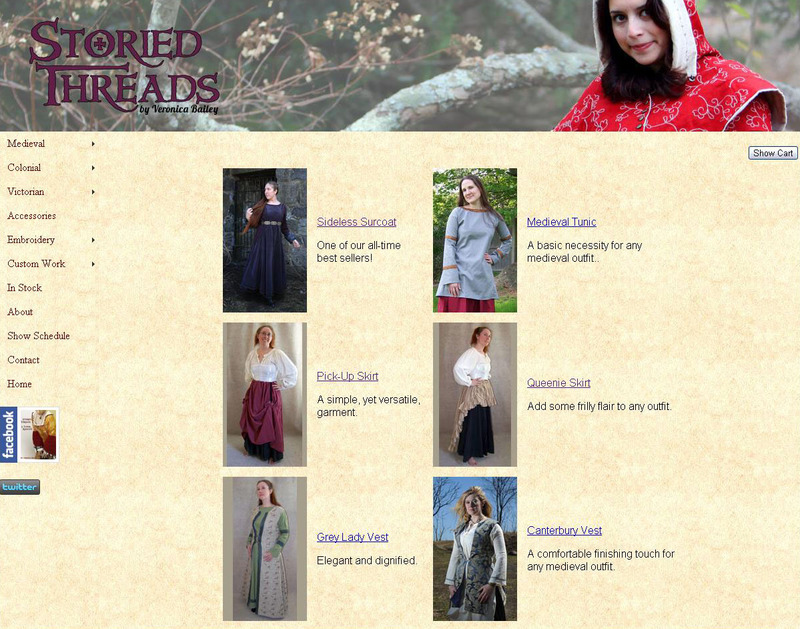 Earlier this year Veronica re-launched her official Storied Threads website and, in my capacity as her idea man-slash-sounding board, I chimed in on everything from the design and layout to the content and text. We approached the website redesign in the same way we approached, no kidding, our wedding: what did we hate about other websites? What do other websites do that we wanted to avoid? What a long list that was. The great thing about the Internet is that small businesses can connect with customers literally across the globe. That’s an awesome thing. Having a potential customer base that is literally worldwide has nothing but positive potential. And yet, many of these businesses don’t tap their full potential because, in being so small and do-it-yourself in every facet of its operation, they wind up creating websites that are total crap. Website design is an art, no doubt, and professionals are paid appropriately for their talents, but those who can’t afford such a service and tackle the project themselves apparently do so without doing a lick of research — and hey, thanks to the Internet they can do that for free, so there’s no excuse not to do some legwork first. Indeed, laziness, rather than incompetence at web design, is the small business owners’ true hurdle. They seem to figure that a lousy web presence is better than none at all, but that’s only barely true; a British study found evidence to suggest that something as simple as a glaring spelling error can drive business away to a huge degree. What small business owners often don’t realize is that their website is what creates that all-important first impression. It offers customers a quick look at the business as a whole, and if an online shopper sees a poorly designed website chock full of misspellings, it creates an instant bad impression. To the shopper’s mind, it reflects the quality of the business, even its credibility; the British study said that shoppers equate misspellings with fraud, as poor spelling and grammar are often cited as signs that a website or e-mail is part of a phishing scam. Based on some of the websites we saw in our research, shaky linguistic skills are the least of the sins committed by amateur website designers. We saw sites that pig-piled photos of inconsistent sizes onto a page like a grade-school collage; that placed every scrap of information on a single page rather than creating neatly categorized sub-pages; that contained absurdly out-of-date information; that used photos from another business to represent their own; that publicly posted what should have been treated as confidential information for employees; and — this is one of my big pet peeves — that blared music at top volume whenever the page loaded. I know in some cases the website was not at all representative of the event, product, or service in question, but to someone completely unfamiliar with the business? Imagine trying to sell a house with a gorgeous interior when the first thing buyers see is a rusted-out car sitting up on cinder blocks in the middle of lawn so overgrown it’s hiding Japanese soldiers that don’t know World War II ended decades ago. So, the moral of this little dissertation: appearance matters, even when — especially when — all anyone sees is your little corner of the World Wide Web. On Tuesday, I had a bad night in the studio. Working on a commission with a deadline, and a mistake was made of the variety that wasted hours and materials. It can be fixed (with more time and materials, of course) but at the time all I could think about was the bad, and how frustrating it was, and how much I just wanted to curl up into a ball and cry, and quit forever. In the end, I only did one of those things, and then my bulldog came over and sniffed my face, and my husband came with her and asked what was wrong, and we talked. Mostly me venting and him listening, but he said some good things. He told me, for instance, that I should take the next night off. Not even go up to the studio, just chill out and relax. And I protested — I had wasted time already! I couldn’t just take a night off! So then he said that if I insisted on working, I should ignore the commission. Work on something else — just distance myself from that particular ball of emotions for a day. And I decided that was good advice. So last night, I went up to the studio, ignored the half-finished coat hanging on my dress form, and pulled out an entirely different batch of supplies. Stuff that had been sitting up in my studio for over a year, because that’s how long this new design has been stuck in my head — and I’ve never found the time to work on it. It seems like there’s always something else that needs to be done. Last night, I simply created. I made something purely because I wanted to make it, not because somebody had paid me to or might pay for it in the future. I figured out a design, and got it from an imagined image to an actualized item. Or, well, most of an actualized item — I didn’t quite finish it. And what I learned is that doing that was really, really good for my soul. I honestly believe that it restored my energy for my business even more than simply taking a night off and playing some “Little Big Planet” would have. It reminded me why I do this, and why it’s what I love, and it woke up the part of me that thrives on creating. Which had been sleeping, I think, for a while. So today, go do something you love. Make the time for it. It’s worth it. PS – A blog entry without a picture? Too weird! But when the thing I made is done, there will be pictures then. I promise. Eye patches – yea or nay? So, instead, I decided to approach the concept from a different direction — and this is the result. 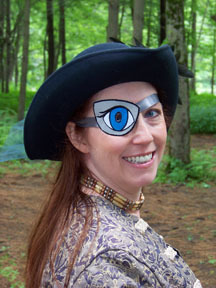 As you can see, it’s a giant eye patch with a giant eye embroidered on it. It has ribbon ties to hold it in place, and a hole where the pupil would be so that you can see out of it. (Vision is not perfect — most of your eye IS still covered, after all. But it’s not bad.) If I were to make them for sale, it would be pretty low-cost — probably a ten dollar item. Right now, the design needs tweaking. Some of it in technical “I can make this better” kind of ways. Some of it in simple things, like moving the placement of the ribbon ties so that it doesn’t have that tilted angle to it. But here’s what I need to know — is it worth perfecting? Is it something any of you would buy? I mean, it IS pretty cartoonishly silly. So if you saw it in my booth, would you giggle, put it on, take a picture, and then walk away from it? Or is it something you’d actually spend money on?